2018 is a year of opportunity with two elections ahead of us. We need to make sure our base turns out in full force for the June Primary. 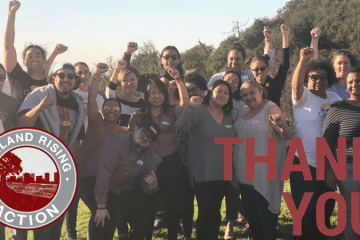 That’s why last week we and our sister organization – Oakland Rising – launched our campaign to mobilize about 14,000 voters in East and West Oakland. 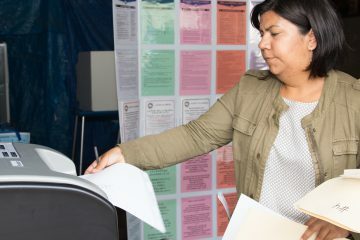 We’ve seen the power that our one-on-one conversations with voters have – the folks we talk to end up voting at a 10-percent higher rate than other Oakland voters! By mobilizing voters this spring, we’ll create the margin of victory needed to bring more resources and restorative justice to our communities. 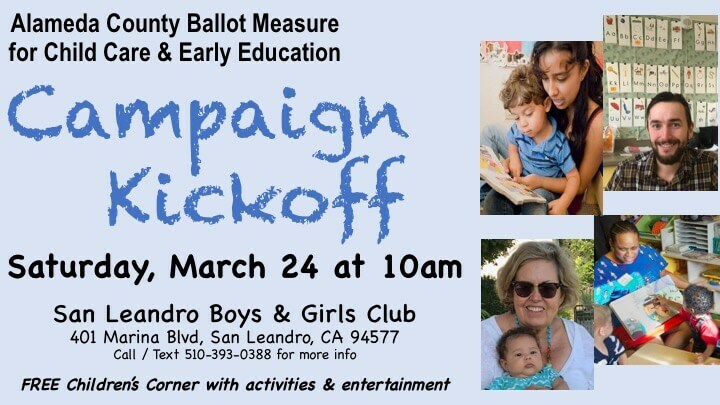 Measure A to increase access to affordable childcare and preschool for 1,000’s of children and families. It also raises salaries for childcare providers to $15/hr. Electing a District Attorney who prioritizes investing resources into more access and opportunity for our community members instead of pushing mass incarceration and criminalization. We’ve partnered with parents, childcare providers and economic and racial justice organizations in Alameda County because we need to actualize a new vision of what power and politics should look like in our communities – one that dismantles the dehumanization and criminalization of our people and invests in greater access and opportunity. Expanding access to preschool and childcare to 1,000’s of low- and middle-income children who are currently turned away because there are not enough spaces, teachers, or funding. Helping to pull our childcare providers out of poverty – they currently earn an average of $29,000/year. In addition to the local childcare crisis, in our most vulnerable communities there has been a historical crisis of over policing and over incarceration. Voters have the opportunity to elect a District Attorney who re-imagines public safety so that our people are taken care of, not criminalized and incarcerated. The DA is one of the most powerful local elected officials! They have the power to not only prosecute people, but to serve as a protector of our most vulnerable communities. Our families deserve to live without fear of harm, police brutality or a school-to-prison pipeline that destroys our communities. Check out this survey that the ACLU conducted with both candidates to learn more about where they stand. We hope this information is helpful in ensuring that all of our community members have a smooth voting experience. Do your part and VOTE!